I have learnt that not all eggs are equal. A well grown egg is a complete food. "Eggs provide protein of the highest quality plus all known vitamins and minerals (except vitamin C)" David W Rowland Health Naturally. I buy free range eggs on animal welfare grounds and I believe that a healthy happy hen must produce a better tasting egg, but I had no idea that a battery-hen egg didn't have the same nutritional value as a true free range egg. I am so lucky I get access to home grown eggs from my neighbours Rob and Claire and my sister Kerry. 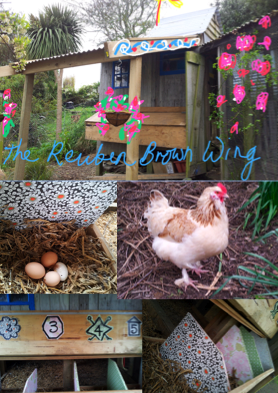 I think Kerry's hens are the luckiest hens I have ever met. 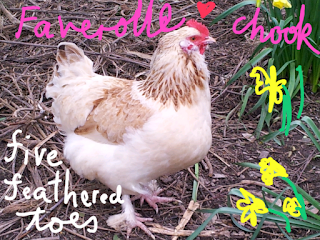 They roam amongst her orchard and live in a dream hen house with a view of the city and harbour. Sorrel Pie can be made in this long tin or a round pie dish, recipe from "Riverford Farm Cook Book"
Sorrel has lemony sharp flavour that heralds the fresh flavours of spring. The tartness of sorrel goes perfectly with creamy eggs so I just had to share this spring time favourite with you all - Sorrel and Onion Tart. Roll out the pastry immediately to line a 24cm loose-bottom tart tin, put in the fridge for 30 minutes while oven heats up to 180C and you begin to prepare the filling. Line top of tart with baking paper and cover with beans or rice to blind bake for 15-20 minutes until golden brown, removing the paper and beans for the last 5 minutes. Remove from the oven to cool before adding topping. * for short pastry use cake or plain flour because it usually contains less gluten protein. For a good short pastry you need to keep the flour protein strands shortened and you do this by coating the flour molecules with butter. For bread making you stretch and extend the protein strands by kneading so that the dough is a strong and stretchy texture while short pastry needs to be a crumb texture to give lightness and crunch. Melt the butter, add the onion and cook gently for 15 minutes until soft. (Be careful with red onions not to brown them or they will become bitter). Cut off the stems (I was shown a trick to remove stems from all sorts of greens by chef Alison Lambert by folding the leaf in half, hold with one hand while pulling the stem in a downward action with the other hand - this is quicker than using a knife). Slice the leaves roughly - add them to the onion and cook for about 2 minutes. 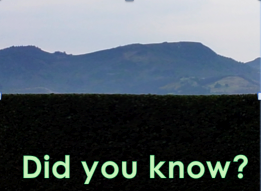 Don't despair when the volume will quickly decreases to about 1/3rd and it changes from a brilliant green to a khaki colour. 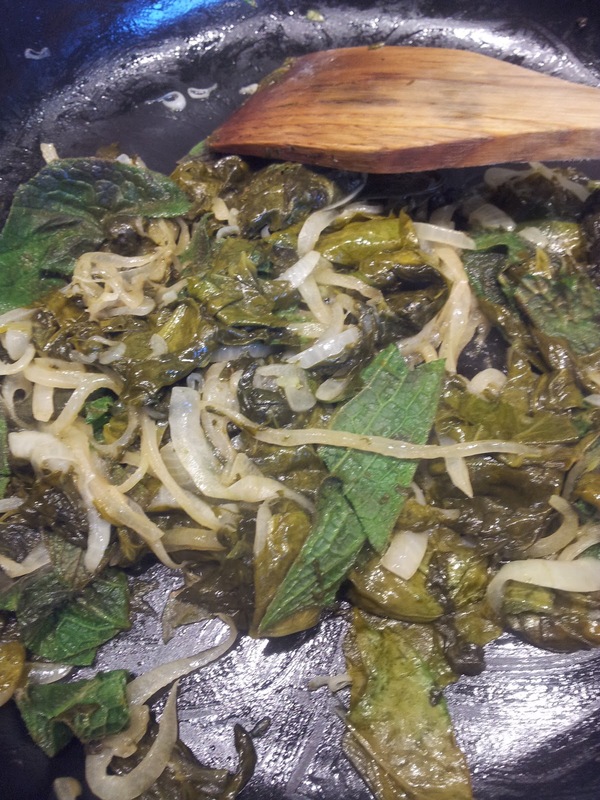 You can also add in a few leaves of comfrey to add extra nutrients to your meal. Whisk the eggs, creme fraiche and milk with half the cheese and season well. Stir in onion and sorrel mix and pour into cooled blind baked pastry case and sprinkle with remaining cheese. Place in pre-heated oven to 150C and bake 35-40 minutes, until the filling is set and slight brown on top. used brown onions but red onions look more decorative. Serve warm with a fresh salad adding a touch of sweetness and colour to contrast with the tart Sorrel Tart. 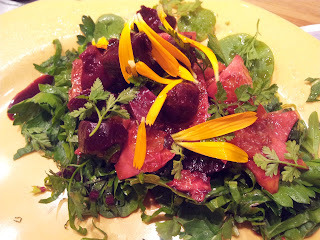 This is the salad I served - greens of rocket, miners lettuce and chervil (but any combination of greens or lettuce would be fine), cooked beetroot with dressing of honey, balsamic vinegar and olive or avocado oil, and slices of oranges (mine had been in a jug of cranberry juice which makes them look like blood oranges - I don't like to waste anything), sprinkled with calendula petals. Top with a drizzle of avocado or olive oil. Sorrel is a garden perennial herb/vegetable easily grown - and I have increased my one patch to many plants around the garden including one in the greenhouse for winter supply. It's easily grow from root division and what an asset to have a vegetable that you don't have to plant every year. Sorrel is in the buckwheat family and it's cousin is the dock. It looks similar to a dock but the leaves are a beautiful soft green and shaped like arrows. 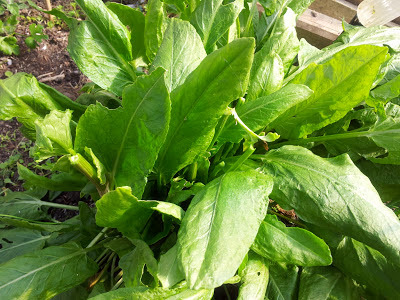 French sorrel has smaller milder leaves. Try and collect the smaller younger leaves for the kitchen because they wont be quite so tart. Keep harvesting it and cut off flower heads to have a continuous supply. It will want to go to flower when the heat of summer arrives. Warning: the tartness in sorrel is oxalic acid so you must not eat too much of it, especially raw, or you could end up poisoning yourself. It has been used in the kitchens of Europe for centuries and has many uses - a finely chopped leaf to a salad or coleslaw to add a zing of freshness, the main ingredient in a traditional sorrel soup, a delicious green sauce that goes well with fish, or added to other cooked greens like spinach, kale or silver beet. Who better to rave about sorrel than Hugh Fearnley-Whittingstall of River Cottage fame. 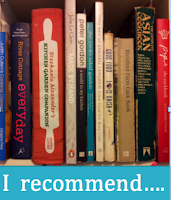 I have the link to his article in The Guardian on my Jeannies.Kitchen facebook page - along with other food related links I have found inspiring while researching for this blog and would like to share. The Incredible Edible Egg - "most complete" protein source in a single food, so much so that they use eggs for judging the quality of protein in other foods. Good quality eggs are an excellent source of vitamin A, B1 and one of the few viable sources of vitamin D.
Eggs are high in minerals; an outstanding source of an absorbable form of iron, calcium, phosphorus and trace minerals. Severe burn patients are fed huge quantities of whole eggs and egg concentrates as a source of protein to rebuild large areas of lost skin. Free range eggs contain a better fatty acid profile (omega3-omega 6 ratio is almost equal which is ideal) compared to total grain fed chickens where the omega 6 can be as much as 19 times greater than the unsaturated omega 3. All the information on eggs I have obtained from "Nourishing Traditions - The Cookbook that Challenges Politically Correct Nutrition and the Diet Dictocrats" written by authors Sally Fallon and Mary G Enig. Sally has a background in nutrition with training in French and Mediterranean cooking. Mary has a PhD and is an expert of international renown in the field of lipid chemistry. She has headed a number of studies on the content and effects of trans fatty acids in America and has successfully challenged government assertions that dietary animal fat causes cancer and heart disease. 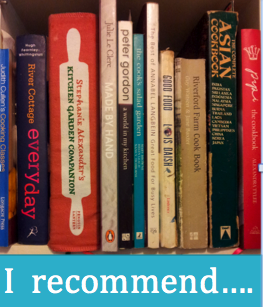 Sally's message is to trust what our grandmothers used to cook and to question low fat diets and polyunsaturated oils. I am keen to know more about the science of food and I will be using this as one of my key references - so if you question what I have written about eggs or want to know more this book is a good start. 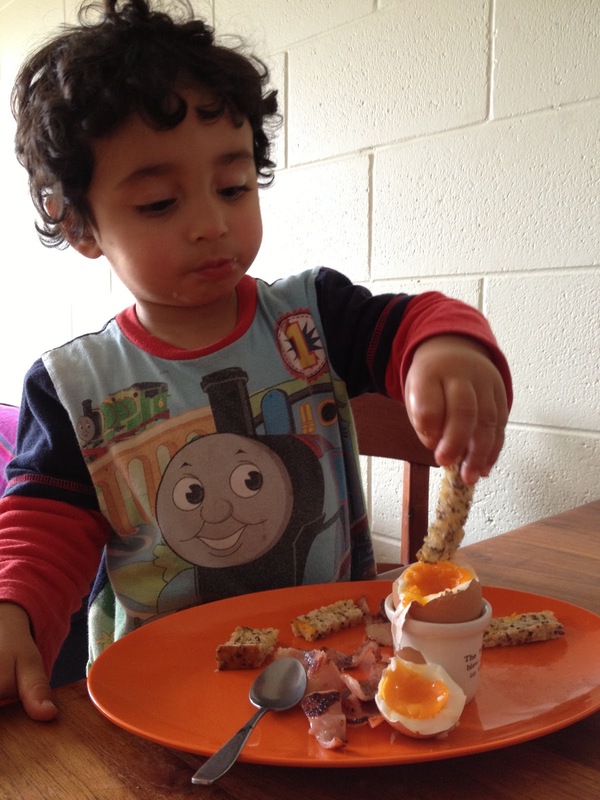 Eggs are an excellent source of long chain fatty acids, that play a vital role in the development of the nervous system of infants and the maintenance of mental acuity for adults. From Nourishing Traditions by Sally Fallon and Mary G. Enig. That childhood favourite Soggy Soldiers is a fun way of getting kids to eat eggs and I fed my children eggs this way because I was taught by my Mum that eggs are a good infant food. Now my grandson Beau loves his Soggy Soldiers....buttered toast slices in finger length strips ready to dip into a softly boiled egg in an egg cup. Not many mum's will know about long chain fatty acids. Thankfully the knowledge that eggs are a valuable brain food has been passed down from our ancestors - and science is proving this wisdom. The Dominican nuns knew eggs were a brain food. When sitting school certificate at boarding school we were given a boiled egg and toast for breakfast. I loved eggs so this was a treat for me. 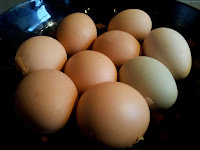 Ironically my sister Kerry hated eating eggs and here she is now producing some of the best eggs around. 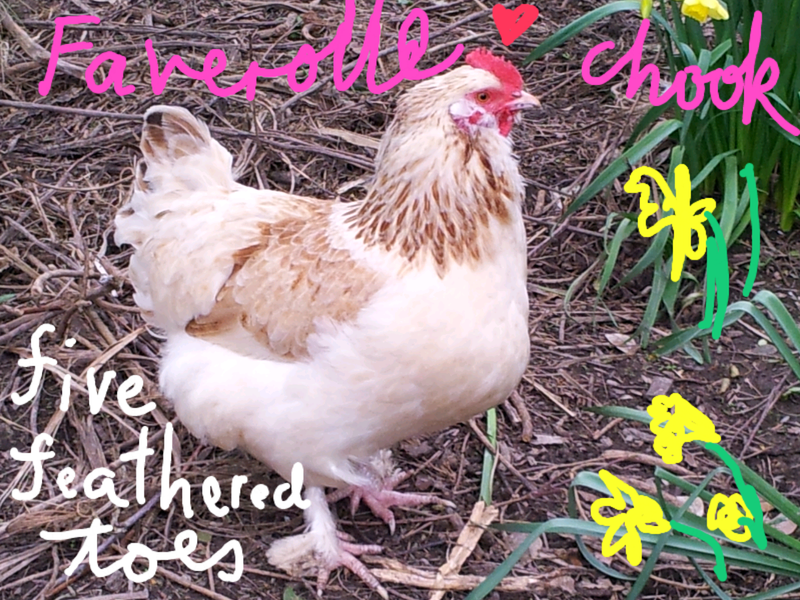 It's the hens she loves and I am the lucky one who gets the high value free range eggs. Now that's a Chook House! Kerry's newly renovated hen house with a veranda so that the nest boxes remain dry and makes collecting eggs a real pleasure. She was inspired by Pamela Brown (who wallpapered the outside of her house as part of her Master of Arts project) to use wallpapers to decorate the nesting boxes. She is waiting to see what pattern the hens prefer. Thanks Jeannie a great post. We have some baby chickens hatching today but looking at these pictures I am thinking their abode might be a little plain! I've liked Pamela's Facebook page now.